I grew-up around guns and learned to shoot when I was 11 years old. A gun by itself never shot anyone. If everyone was trained in the respect and safety of firearms like I was in military school and with shooting teams, we wouldn't have problems like drugs, poverty, and crime. Weapons and firearms training is a whole program as I see it. That is why I propose having military style "boot camps" where we train young Sikhs for 30 days or more in correct use of firearms and Sikh code of conduct. These young Sikhs will also learn valuable life skills of discipline and gain self-confidence. The 10th Sikh Guru, Guru Gobind Singh Ji was a big proponent of making individuals responsible for their actions. I consider the Khalsa panth to have the original "bill of rights" by doing away with Brahmin oppression and repression of individuals through the caste System. 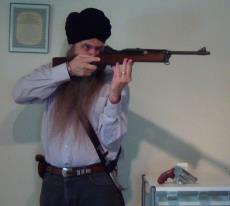 Sikhs were the original fighters for freedom who used weapons against oppressive and tyrannical Moghal rulers. I consider it to be a blessing to live in America where we can buy and carry firearms. Americans believe in individual rights and RESPONSIBILITY whereas many European countries do not trust the individual to be responsible for their own actions. I would much rather live in a society where there are individual rights like the right to bear arms and where individuals are trusted from the outset, given the benefit of the doubt, than live in a society that tries to "protect me" and "save me" from myself and others. Sure a few individuals will abuse this right but that is the price we pay for having love for humanity and loving freedom. The welfare states in Europe are not my idea of a life that can be lived with pride and respect.